Description: From Lake Forest Park town center thru LFP neighborhood, around Acacia cemetery, down to Burke Gilman Trail. BGT to Log Boom park with places to sit and enjoy the view of Lake Washington,. Walk onto the fishing pier at Lake Washington. Return on goat trail road with great views of Lake Washington from an elevated vantage point. Start Point / Driving Directions: 17171 Bothell Way, take exit 177 205th NE/Ballinger Way, I-5 northbound exit right, I-5 southbound left at stop light. Ballinger Way SR104 to end at Bothell Way. Turn right and then an immediate right into the Albertson’s parking lot. 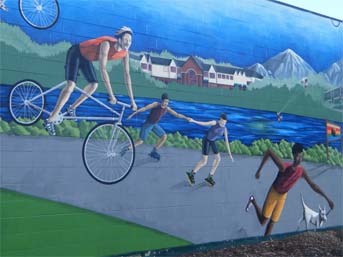 Comments: Challenges: Walking Americas Murals (along the Burke -Gilman Trail); Lakes & Reservoirs (Lake Washington); Trekking with the Trees (Lake Forest Park); You’ll Never Walk Alone (Burke-Gilman Trail).